Best Western Lozenetz Hotel in Sofia is ready to welcome each guest with individual treatment combined with business, style and atmosphere. Best Western Lozenetz Hotel offers 27 elegant rooms type Comfort and 4 suites with a unique original design. Quality of service is ten-year history of the hotel - room service , breakfast in the price , Wi-Fi, flat- screen LCD, richly stocked mini -bar , central air conditioning and telephone. 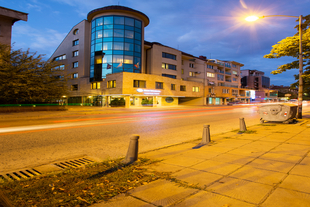 BEST WESTERN Lozenetz Hotel is located in a very convenient location in the prestigious Lozenetz, in particular the famous boulevard Sveti Naum. Adjacent to the European Union Metro Station and 15 minutes from the airport, the hotel provides an excellent opportunity for easy and convenient travel throughout the city. Restaurant Lozenetz consists of a covered area with 40 seats. During the summer months the location of our guests and a spacious garden with 40 seats. The stylish design and decoration, combined with discreet background music and cozy atmosphere, privacy and comfort. Your reservations inquiry send to marketing@lozenetzhotel.com. For more information and online reservations: www.lozenetzhotel.com.